WE MADE IT! 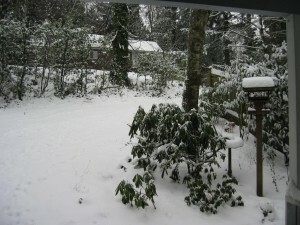 2007 started off with some white fluffy stuff that made me very excited that I didn’t have school for half a week. Josh spent a week on vacation playing WoW 24/7 while I examined the hairy thing that has made its way back to the guest bathroom ceiling. For anyone who remembers Halloween 2005, “it” is back… longer and hairier than ever before. I should really make a thriller about this.